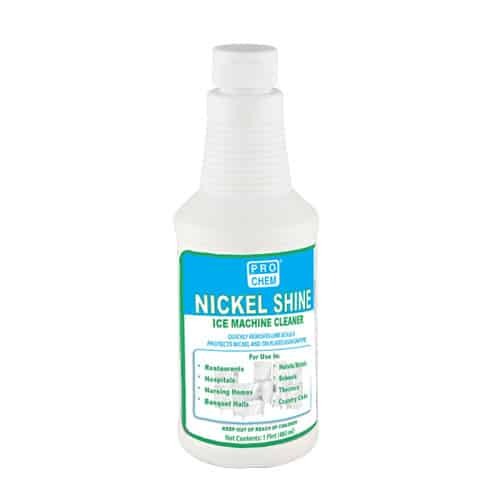 NICKEL SHINE | Pro Chem, Inc.
NICKEL SHINE quickly removes built-up lime, dirt and scale to improve the quality of the ice and prevent equipment jamming. Its special inhibitors minimize corrosion while removing built-up scale. It is safe to be used on stainless steel, nickel-plated steel and tin-plated and nickel evaporators. * Not for use on food contact areas. Turn off ice machine and empty it. Switch ice machine to “clean mode.” Drain water reservoir and drain tray. Refill with fresh water, adding 8 ounces of NICKEL SHINE per gallon of water. Start water circulating (pump only) and run 20 minutes. Rinse three times before using to make ice. To clean the ice bin, dump out the ice. Spray the cleaning solution (8 oz NICKEL SHINE per gallon of water) in the bin. Use a brush or sponge to apply cleaner to scaled surface. If scale is extra heavy, drain and repeat the cleaning procedure. After scale has been removed, drain and flush 3 times. For stainless steel ice machine drums, add 8 ounces of cleaner per one gallon of water in a plastic container and brush the solution on the scaled areas. After cleaning, flush all surfaces thoroughly with fresh water.